Season goat and marinate for 24 hours. Remove seasoning and brown in hot oil. Braise in water, pepper, onions, and all seasonings again until tender. Simply take a ripe plantain and cut at a bias at ¼-inch thickness and cook in oil at 350 F degrees for 1 minute. Be sure to continue to flip to make sure both sides brown evenly. Mix all the above ingredients together and let cool in refrigerator for at least 30 minutes, allowing flavors time to combine properly. Serve with rice and beans, vegetables and mango-papaya relish. 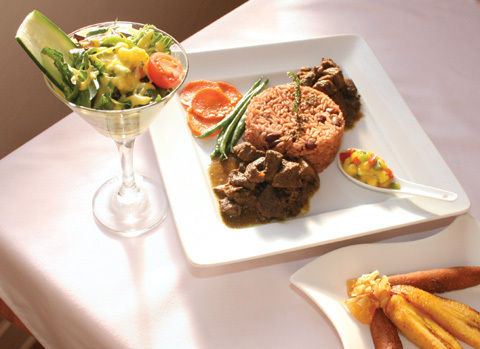 At Jamaica Café, entrees are accompanied by plantains, festival and salad with mango dressing. Garnish the dish with stewed pineapple and almonds. The pineapples are cubed and stewed at a high heat with cinnamon sticks while the almonds are flambéed in Myers Jamaican rum and candied with brown sugar.